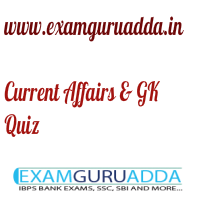 Dear Readers Examguruadda.in presents Current Affairs quiz of 9-10th December 2016 that cover important current affair events. Current Affairs quiz for IBPS PO,clerk, RRB-Po,Clerk, SBI, NIACL,Railways and SSC Exams. 1. The world’s largest seating capacity cricket stadium will come up in which state of India ? 2. Who has won the 2016 Presidential election of the Republic of Ghana? 3. Who has become the acting president of South Korea? 4. What is the India’s rank in the 2016 Global Terrorism Index (GTI)? 5. The tropical cyclone ‘Vardah’ is expected to hit which country? 6. Human Rights Day was observed on which date....? 7. Which Free to air channel launched by government to educate people about digital payment? 8. The book “Dipa Karmakar: The Small Wonder” has been authored by whom? 9. Which committee has been constituted by Internet and Mobile Association of India (IAMAI) to fight against the menace of online piracy? 10. Which committee has recently submitted its final report on digital payments to Union Government?